Artist's sketch of the "Alma"
In central Asia, in what, until a few years ago was the Soviet Union, there are stories of a large, ape-like creature that inhabits the mountains. It goes by the name of the Alma. Unlike the better known Bigfoot and Yeti, reports about the Alma say that the creature is much more of a rough, hairy human than an ape. Professor Boris Porchnev, of the Moscow Academy of Sciences, published a description of the creature based on detailed stories he'd gathered from people who had seen it. "There is no underlayer of hair so that the skin can sometimes be seen," says the report. "The head rises to a cone-shaped peak," it continues, and "the teeth are like a man's, but larger, with the canines more widely separated." Porchnev's description also noted that the Alma can run as fast as a horse and swim in swift currents. Breeding pairs remain together living in holes in the ground. For food they eat small animals and vegetables. The creatures are mainly active at night. The report also noted that the animals have a "distasteful smell." The first stories of the Alma were gathered in 1881 by N. M. Pzewalski, a traveler in Mongolia who also discovered the Mongolian wild horse. During the Second World War refugees, soldiers, and prisoners of war, often reported seeing the Alma. Slavomir Rawicz, in his book The Long Walk, the story of his escape from a Siberian labor camp, tells of being delayed by a pair of Almas. Chinese soldiers reportedly put food out for the Alma and watched it eat. M.A. Stonin, a geologist, was prospecting near Tien Shan in 1948. One morning he awoke to cries by his guides that the horses were being stolen. Stonin grabbed his rifle and headed outside to find a figure standing by the horses. It had long red-hair all over it's body. The creature moved off at Stonin's shouts and he chased after it. The animal was so man-like, though, that Stonin couldn't bring himself to shoot it and the thing escaped. In 1957 a hydrologist named Alexander G. Pronin, on an expedition to study water resources, reported seeing "a being of unusual aspect." It stood at a distance in the snow with it's legs wide apart and with arms longer than a normal man's. Pronin watched it for five minutes, then the creature disappeared behind a rock. Three days later he saw the figure again briefly. Then a week later one of the group's inflatable boats disappeared without explanation and was later found upstream. Pronin found out that the locals often blamed the "wild man" with stealing household items and taking them into the mountains. This made Pronin wonder if the Alma was responsible for the missing boat. Alma's have reportedly been shot and killed, but the carcasses have never been examined by scientists. In 1937, during a clash with the Japanese, a Russian reconnaissance unit in Mongolia spotted two silhouettes coming down a hill toward them. When the figures did not respond to a challenge, sentries shot them. Then next morning the recon unit was surprised when they examined the bodies. 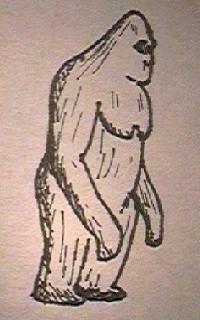 They were of a "strange anthropoid ape" that was about the size of a man and covered with long red hair. Unfortunately, because of the war, the bodies could not be returned to Moscow for a proper evaluation. While the Soviet Union was still together several expeditions were mounted to look for the Alma. While they gathered some interesting stories, and a few unusual artifacts, no Alma was ever captured and Soviet scientists became split over the value of searching for it. Dr. Proshnev took quite a ribbing from his colleagues because of his work on the subject. Proshnev speculated that the creature is perhaps the last surviving group of Neanderthal men. At least a few western researchers, including Dr. Myra Shackely, of Leicester University in England, agree with him. Shackely, who visited Mongolia in 1979, points out that the entire area is loaded with Neanderthal artifacts. She notes that if Neanderthal were to have survived it would most likely have been in those areas were the Alma is reported. Since the dismemberment of the Soviet Union little has been done to continue research on the Alma. Those regions were it has been reported are often politically unstable, and economic conditions in Russia, who inherited many of the scientific institutions of the old Soviet Union, have not been favorable to allowing continued research on the "Wild Man."